This is a post from the Milwaukee google group of which I am a member. There are many exciting things posted there from time to time. There are great stories of storms at sea, the ship's part in carrying supplies to Vietnam, bringing King Tut's mummy to the United States, and of course, the everyday tensions that occur aboard any ship. But this one, sent in by A. Springer, a Boatswain's Mate from the ship's first days at sea in 1969, was so low key in it's delivery, that I thought I would print it here. It is an unusually matter of fact account in the life of a ship, and a sailor, over the course of a few months. And it's living proof that you don't have to be a professional writer to convey a slice of life in an accurate and engaging fashion. 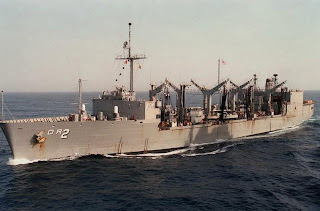 It was 1970 when the Millwaukee returned from Gitmo Cuba and she docked back in Rhode Island base and unloaded all Munitions to that little island in the river. The next day we sailed to Boston and entered the Charlestown Naval yards for repairs. We docked about 3 piers over from the Constitution because one had to walk right by it to leave the base. Then there was the Jarheads and they had a bar with happy hour every afterrnoon about 4pm. Them guys and their little station at the gate would screach you comeing and going even if you just went to the YMCA across the street from the base. The Milwaukee stayed at the yards there untill around August and when she was fit for sea trails we left for a day test after we left the pier they set the watch and i had the helm from around 8 am to 2 pm i know it was a stright 6 hours because the captain didnt want to bother changeing the watch for 2 hours. The USS Kennedy was setting in the South Boston Yards when we left ,and when we were comeing back that day of test run, we meet the Kennedy comeing from the harbor. She was sailing for Veit Nam and her deck had over 100 planes on it, iTHINK we had to man the rail for her passing too. After we passed the lighthouse at the end of the harbor the QM took the helm and i was relieved of duty thank god my legs were killing me. It was the ONLY time i ever stood the helm watch in the daytime, i had the helm watch many a night from 12 to 4 (The MID ) and i think that was because i must have pissed off BM/1st class Lawya once. After the ship was said to be fit and seaworty she then headed to the Med her first time. But she left without me. i got send to the south Antics In Boston where i got my Honable discharge a few months later.